Such adventures at the Ishum house! 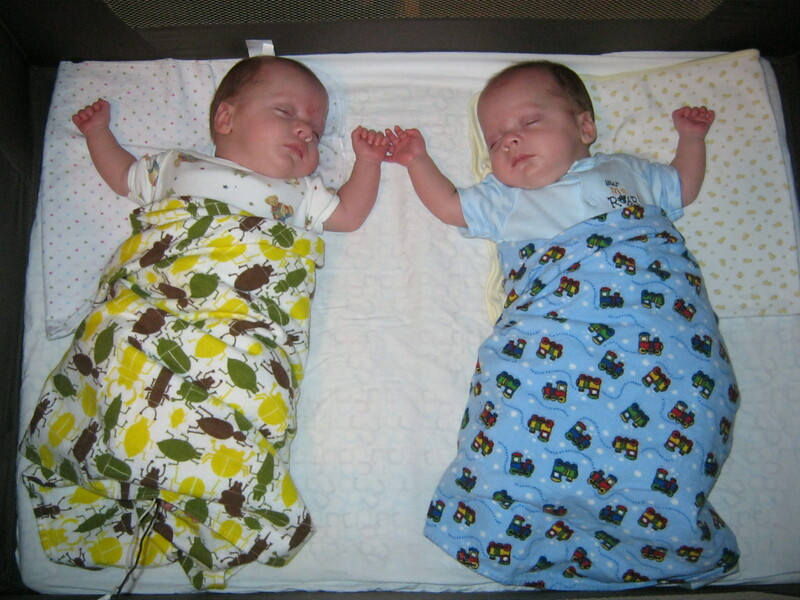 The babies have now been home for a month and will be four months old tomorrow. It’s just flying past! Sean and I haven’t had a joint break out of the house together since they’ve come home though. I was hoping at some point in the near future to get to spend a little quality time with Sean, so I was delighted to get a text message from him last Tuesday about it! I sleep in the living room next to the babies’ cribs, so I immediately went upstairs to check on him. “On a scale of 1 to 10, with 10 being the worst, what is your pain level?” “About an 8.” Great. Within a few minutes, I had called my mom to come over and help along with the overnight helpers who were already at our house and we were on our way to the emergency room. All of the way there, I was wondering if I was going to end up with four infants and an appendectomy patient to take care of. We hadn’t been back to Saint Luke’s Hospital in a few weeks, so really, it was high time to visit. So on our first date out of the house alone, I was just hoping that he would spend $25 and take me out to a quick dinner then back home to the babies. Nothing fancy. Instead, he was a high-roller and spent $125 (co-pay), and gave me a 5 hour break from the babies at our “second home.” He forgot the food and drink, but at least he kept his appendix. What was the problem? Blood, urine, and CAT scan tests all came back fine, so the doctor said it could have been something he ate or a small kidney stone. Thank goodness that is all it was! Now all six of us have been patients there this year. I bet our insurance company loves us! In the wee hours of Saturday morning, we lost power at our house. The big storm that rolled through took out the power for over 60,000 people in the Kansas City metro area. 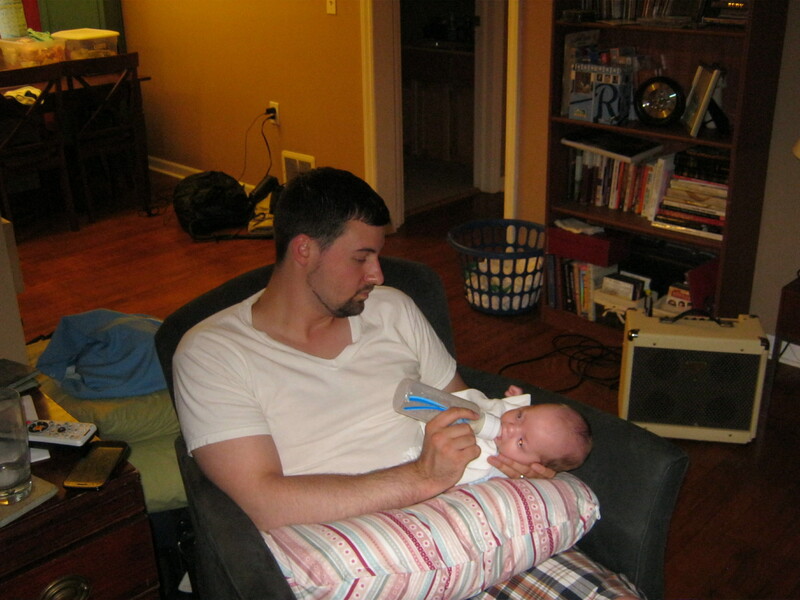 We quickly learned how to change diapers and make formula by flashlight. When the power still hadn’t come back on a few hours later, I called my sister-in-law, Sarah (who works for the power company) to see if she had any idea of when they might restore power. She said that it could be quite a while, so Sean and I decided that we needed to move the babies because the house was heating up and the battery back-up on their monitors wouldn’t last much longer. Sarah and Mike invited us over to their house to hang out until everything was fixed. Sarah checked the updates and told us that because one of the main lines went down, it could take 24-48 hours to bring everything back up. They headed over to our house to help and we commenced Project Relocation with the understanding that we might be staying with them for up to two days. Holy cow! Babies have a TON of gear that has to go with them! Especially when you multiply it by 4! We filled the trunk of Mike and Sarah’s car and the back of our minivan with baby paraphernalia. 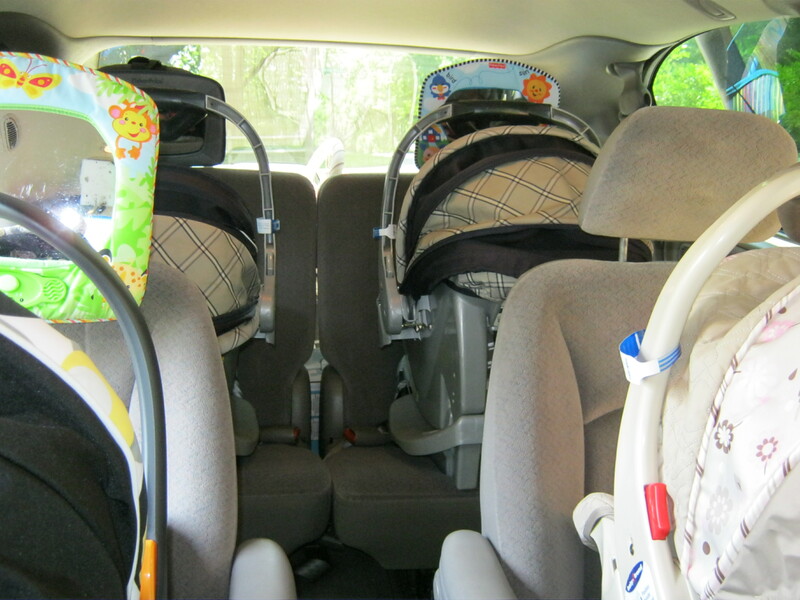 With four car seats in the body of the van, there isn’t enough room for anything else. We ended up staying with them for about 26 hours. Sean and I had fun getting to spend time with one of our favorite couples, but the babies were definitely ready to go home by the time we were able to move everybody back. 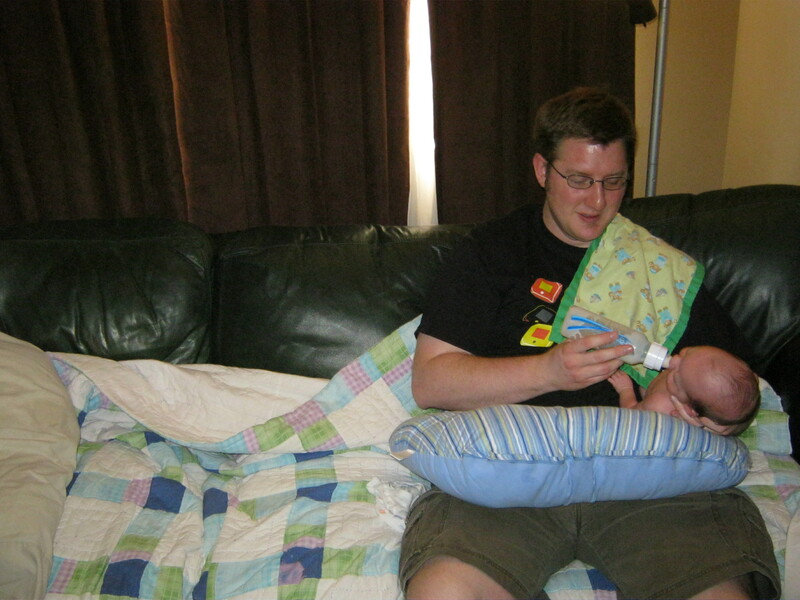 It was so kind of them to invite us over as Sarah is eight months pregnant with their first baby. 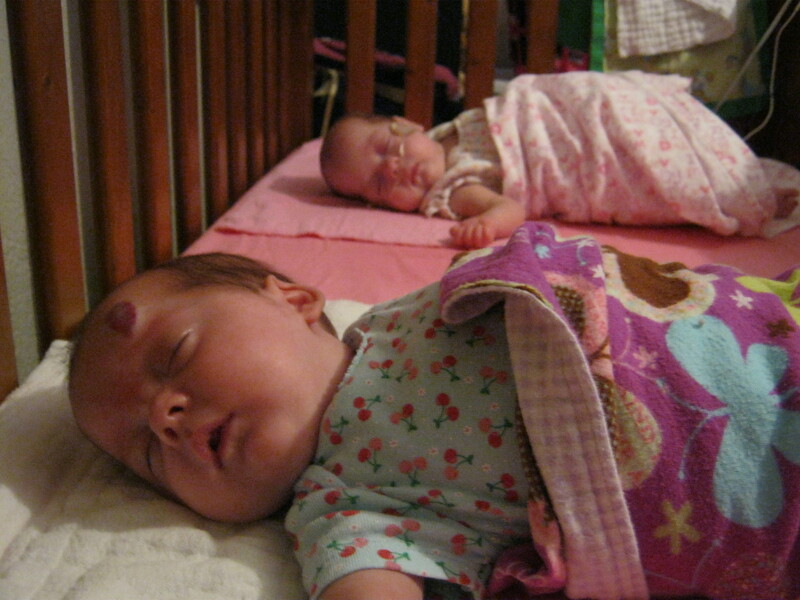 They even let us use Alyvia’s crib and room while we were there! All loaded up and ready to go! It’s a full mini-van! Cousin Aly’s room that our babies field tested. Good news, Mike and Sarah! It’s perfect! …so we fixed it like this! If they couldn’t reach out and touch each other, they got along MUCH better! 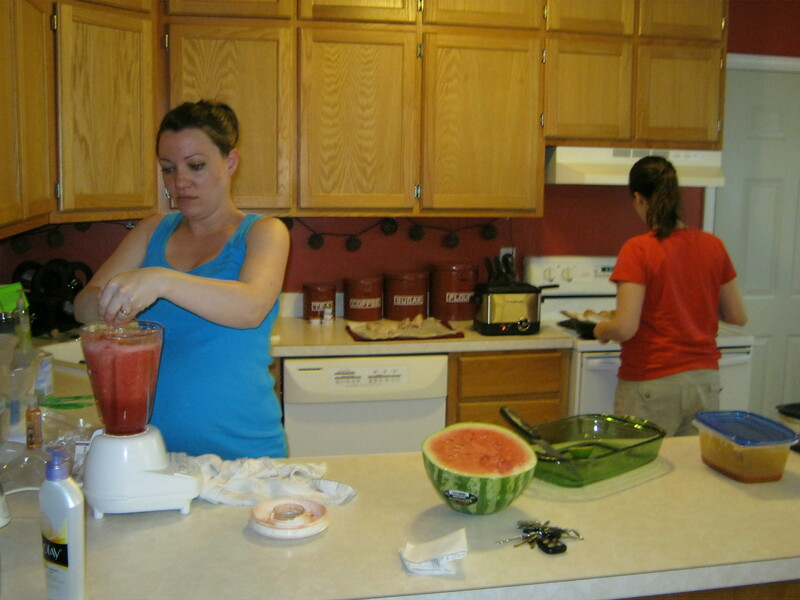 Aunt Sarah and Mommy making dinner for the adults: Watermelon Lime drinks and homemade buffalo wings! So fun and super yummy! As nice as it was to get out of the house for a bit, now that we’ve done an overnight trip with the babies, we most definitely will not be traveling again anytime soon if we can possibly avoid it. It’s seriously like moving! Wow! On the upside, at least we know we can move them if necessary! 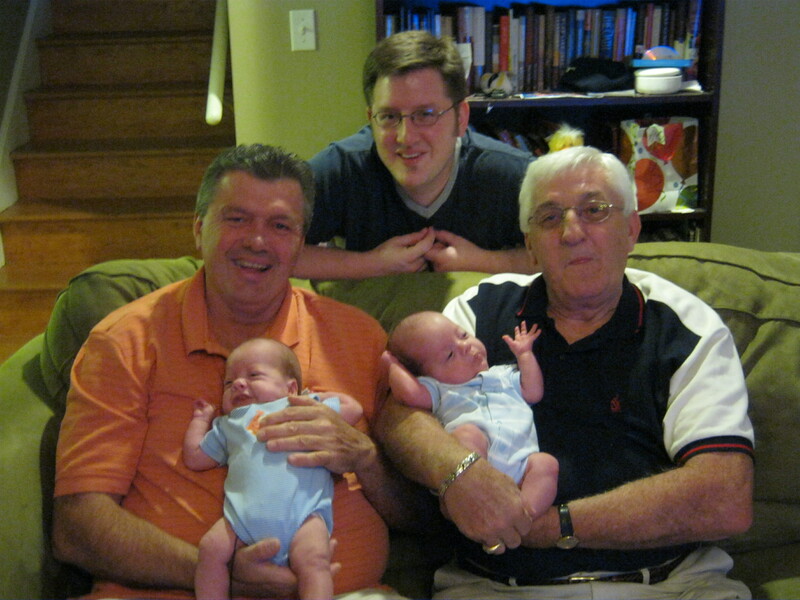 And then I love this photo of four generations of Ishum boys! The four generation is special. Don't get many of those. Yoy also have a possible 5th generation in a round about way. Ruby also. 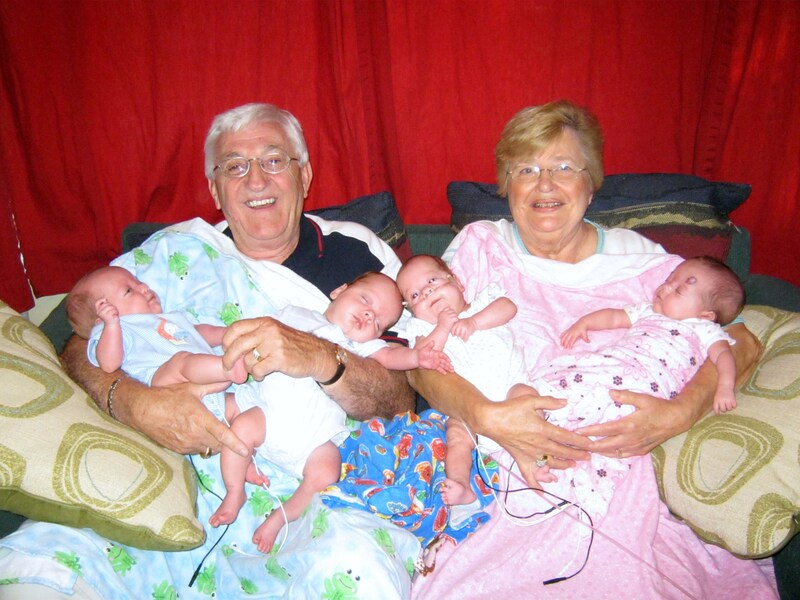 Babies, Sean, Debbie, Larry, and Aunt Rovilla or Aunt Eva. Love your stories!! What an adventure! I love the adventures of the quads, while I'm sure not funny to you, it is funny to me to hear the stories. I can't imagine, but it sounds like you guys are doing great. While they are still probably in the preemie category in a few months they will start rolling and crawling, can't wait for those stories. Holler if you need anything, we are right around the corner. Wow, you guys really know how to have an adventure! ;-) SO fun to see all these pics. Glad to hear Sean is OK! This is so great to see and hear of the "normal" adventures of your family. Oops, I should say "adventures x 4." Adorable, especially the photo of Ellie in the car seat, looking so confused! I can tell you were a creative writing major ;-) Even though I'd heard the stories, reading them was even more fun! Sounds like quite the adventure! We had a major storm a couple night ago, and like good Nebraskans, we were out on the porch watching it roll in. I actually took the baby gate off the stairs in case we needed to grab the babies and dash downstairs. 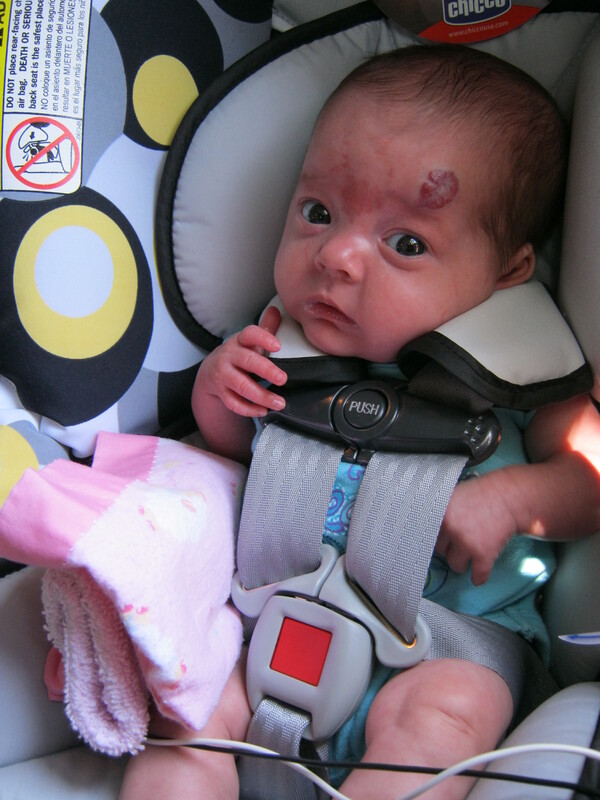 Also, is that a hemangioma on Ellie's head? My son has one on his cheek too! Whenever people as me about it, I tell them it's how I tell the boys apart. :o) My pedi told us it would stop growning about 6-7 months and start fading at a year. I'd say both are true. It's a part of him that I love, but I wouldn't mind if it went away before he started school. Anyway, your babies are adorable and I love your blog. Definitely some fun! Glad Sean is back to normal too! Love the generation pics as well!